Recently we revealed that the “progressive” group Our Maryland is in reality a propaganda arm of the Maryland Democratic Party establishment machine. Our continued research has revealed that Our Maryland’s corporate directors include three influential establishment operatives of the Maryland Democratic Party machine. Our Maryland has been advertising for its Politics and Policy Summit tomorrow in Annapolis. The summit features establishment Democratic politicians like Attorney General Brian Frosh, Delegate Maggie McIntosh. They are also discussing post-election poll results from pollster Margie Omero. Margie Omero is a Democratic pollster for the Democratic polling firm of Penn, Schoen, and Berland (PSB). Prior to joining PSB, Omero’s clients included such grassroots groups as: the Democratic National Committee, Democratic Congressional Campaign Committee, and democratic donor outfit Emily’s List. Emily’s List employs our old friend the banjo troll after he was excused from his job helping the Maryland Democratic Party drive up Governor Hogan’s favorability numbers. PSB was founded by Bill and Hillary Clinton’s pollster/communications operative, Mark Penn. PSB also features grassroots corporate clients such as Coca-Cola, Ford Motor Company, McDonalds, Microsoft, Walmart, pharmaceutical giant Glaxo-Smith Kline, and standardized testing company Pearson (the firm that that produces the PARCC assessment). Polling isn’t cheap, especially when it’s polling performed by a bigshot Democratic firm like Mark Penn’s firm. So where is Our Maryland getting the scratch to afford a major Democratic and corporate polling firm? If you click to order the $80 ticket to Our Maryland’s summit, you are taken to its ActBlue site. ActBlue is a fundraising apparatus for Democrats. Our Maryland also solicits donations through ActBlue, which is registered with the Maryland Secretary of State’s office as a charitable organization. Act Blue boasts that a majority of Democratic Senate and House campaigns, along with the Democratic Senatorial and House Campaign Committees, and the Democratic Governor’s Association, use its services. 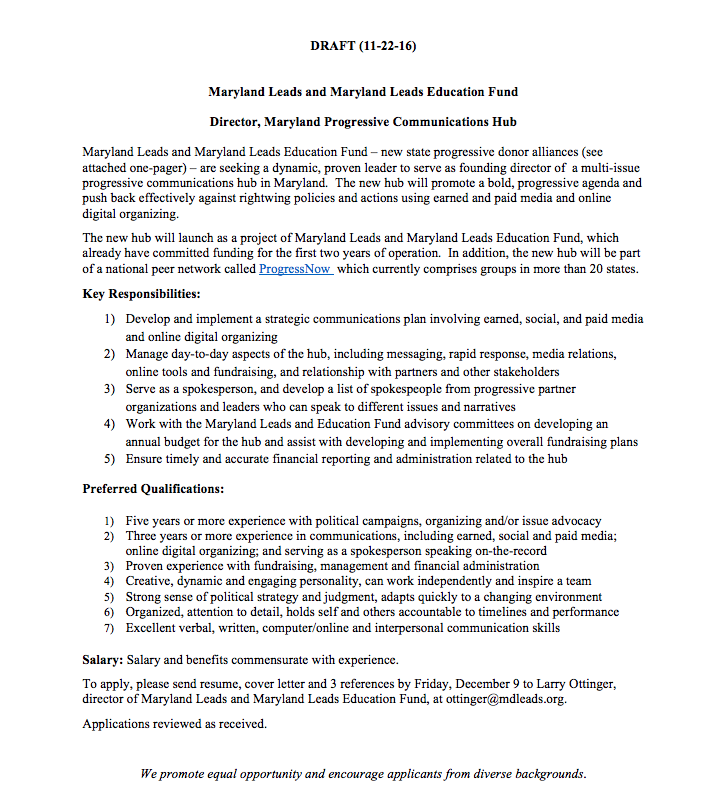 Maryland Leads and Maryland Leads Education Fund – new state progressive donor alliances (see attached one-pager) – are seeking a dynamic, proven leader to serve as founding director of a multi-issue progressive communications hub in Maryland. The new hub will promote a bold, progressive agenda and push back effectively against rightwing policies and actions using earned and paid media and online digital organizing. The new hub will launch as a project of Maryland Leads and Maryland Leads Education Fund, which already have committed funding for the first two years of operation. In addition, the new hub will be part of a national peer network called ProgressNow which currently comprises groups in more than 20 states. Key responsibilities for the job include serving as a spokesperson (Hi Pat Murray), developing spokespeople from different progressive partner organizations, and working with the Maryland Leads and Education Fund advisory committees to develop fundraising and budget plans. Interested applicants are instructed to email Larry Ottinger at ottinger@mdleads.org. As it turns out, Our Maryland is a project of Maryland Leads/Maryland Leads Education Fund. So what is Maryland Leads/Maryland Leads Education Fund—the entity listed as the recipient of the proceeds from tomorrow’s big event? Maryland Leads and Maryland Leads Education Fund are most likely the official parent group of Our Maryland for tax purposes. Most Democratic/left-wing advocacy groups organize themselves at non-profit charities under section 501 of the IRS code. Yet, Maryland Leads and the Maryland Leads Education Fund are not listed in the Maryland State Department of Taxation’s search database. But both Our Maryland and Our Maryland Education are registered as tax-exempt non-stock corporate entities (501c3) with the Maryland State Department of Assessments and Taxation. Both entities were formed on May 2, 2017. According to its SDAT filing, Our Maryland Inc. is organized for the purpose of teaching “advocacy, organizing skills to progressive Marylanders to furnish effective support for progressive causes and candidates for office.” Basically, Our Maryland is organized to be a tax-exempt wing of the Maryland Democratic Party. However, the Our Maryland Education Fund filing with SDAT states that its purpose is to “educate Marylanders on progressive issues and strategies” from a “non-partisan” perspective. Most non-profits post their IRS 990 disclosure forms publically to the Guidestar website. Maryland Leads/Our Maryland disclosure forms are not publically available. The three corporate directors listed on Our Maryland’s filing are Larry Ottinger, Pat Murray, and Ed Hatcher. So who are these three gentlemen? We already know about Pat Murray, the Maryland Democratic Party machine hack. He is the party’s former executive director, and was an aide to both Senate President Mike Miller, and Speaker of the House Mike Busch. We also remind our good government progressive friends that as an aide to Miller during the 2011 redistricting process when Murray, then a state employee, conducted official business on his personal email, something that was revealed in Mike Miller’s sworn deposition in the redistricting lawsuit. Besides acting as the contact for the Our Maryland job posting, Larry Ottinger’s LinkedIn page, reveals that he has been with Maryland Leads since January 2016, and seeking employees since November 2016. This means the organization should have at least one annual disclosure form on file with the IRS. Red Maryland has requested a copy of this filing. Ottinger’s LinkedIn page also states that he has also served as a Board Member of Progressive Maryland, an adviser to George Soros’ Open Society Institute, and is the chair of the Ottinger Foundation, a donor foundation for progressive advocacy groups. Just like Maryland Leads, The Ottinger Foundation disclosures are not available for public inspection on Guidestar. State campaign finance records indicate Ottinger has donated nearly $5,000 to Maryland Democratic candidates including Martin O’Malley, Brian Frosh, Rich Madaleno. The campaign finance records for these donations also list the same Chevy Chase address as listed in Our Maryland’s SDAT filings. Ed Hatcher is the head of the Hatcher group, a Democratic public relations firm. Hatcher is a former press secretary to several congressional Democrats. Hatcher also sits on the advisory council for the Maryland Clean Energy Center, a state entity. The Maryland Clean Energy Center also happens to be a Hatcher Group client. The November 2016 Maryland Leads/Our Maryland job posting shown above is hosted on the Hatcher Group’s website. The Hatcher Group has offices in Bethesda, Baltimore, and Annapolis. The firms Annapolis office employees include two communications operatives from the O’Malley administration and a Democratic member of the Anne Arundel County Council. In fact, the Hatcher Group’s client list reads like a who’s who of Democratic allied advocacy groups in Maryland: 1,000 Friends of Maryland, Chesapeake Bay Foundation, Progressive Maryland, Town Creek Foundation, SEIU, George Soros’ Open Society Institute, as well as Attorney General Brian Frosh’s social media. One Hatcher Group client of special note is the Job Opportunities Task Force. The Job Opportunities Task Force is a vocal supporter of the job-killing paid sick leave bill Governor Hogan rightly vetoed. After Governor Hogan announced his compromise proposal to the Democrats flawed job-killing bill, Our Maryland posted a rebuttal featuring, you guessed it, Hatcher Group Client the Job Opportunities Task Force. No reasonable person would believe that to be a coincidence. Maryland Matters is reporting that sponsors of Our Maryland’s Politics and Policy Summit include a who’s who of establishment Maryland Democratic Party interest groups: Maryland State Education Association, Service Employees International Union Local 1199, the Maryland/D.C. State Council of SEIU, AFSCME Maryland, and The Hatcher Group. Democratic gubernatorial candidates Kevin Kamenetz, Ben Jealous, Rich Madaleno, Jim, Shea, and Krish Vignarajah will be among those addressing the crowd tomorrow. What does this all mean? It means that the Our Maryland summit is a de-facto Maryland Democratic Party event. At least two of the Hatcher Group’s clients, The Job Opportunities Task Force and SEIU 1199 are sponsors or presenters. Pretty convenient for Ed Hatcher, but that’s the type of self-dealing sleaze that characterizes the Maryland Democratic Party. It is crystal clear that Our Maryland is an overtly partisan political operation run by Democratic Party operatives masquerading as an innocuous “charitable organization,” one that is keen on shielding its funding and operations from the public. 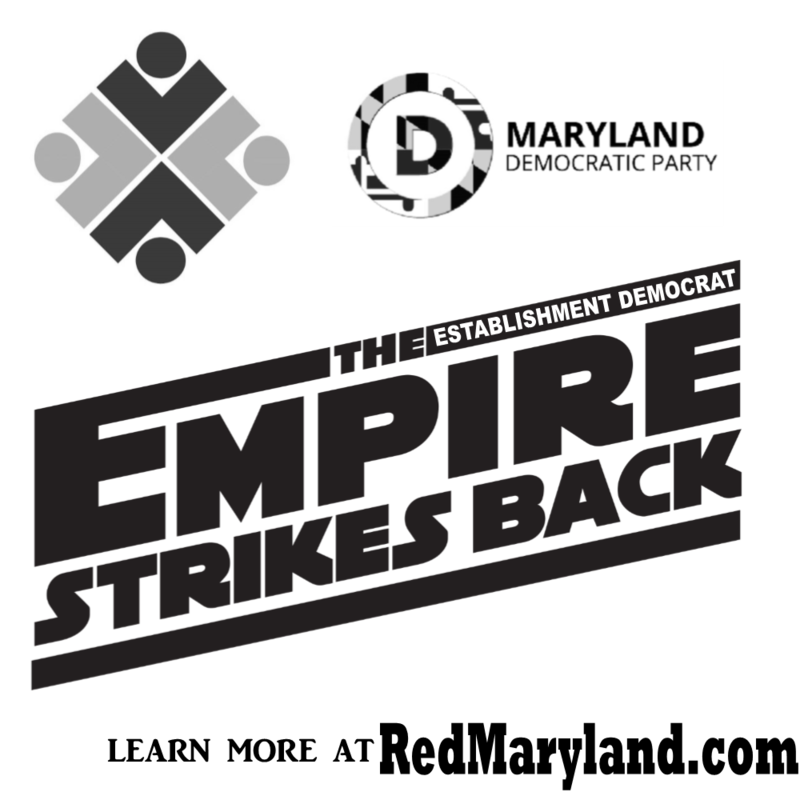 The next time you see the virtue signaling propaganda from Our Maryland and it’s slick public relations firm realize that it isn’t a symbol of grassroots “resistance,” rather it’s the Maryland Democratic Empire trying to strike back.